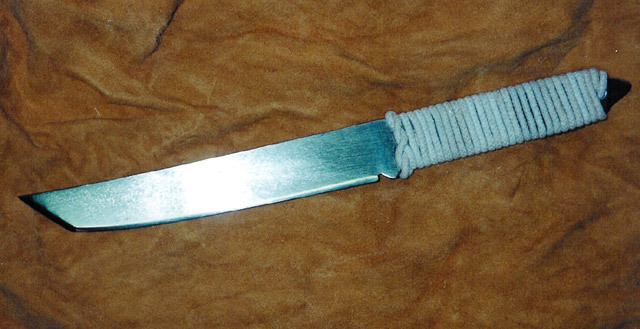 A tanto style blade made from 3/32″ bandsaw blades steel, differentially heat treated in motor oil and a cord wrapped handle. BL=7″, TL=11 ¾”. This knife and the three below were made in high school Metal Shop. Another tanto style blade ground from an old carbon steel Ontario hammermark butcher blade I found. Brass bolsters, black spacers and a curly maple handle oiled with linseed. BL=6 ¾”, TL=11 ¼”. This is a boot-knife style I ground from a larger handle-less Sabatier carving knife I found in a old dump on our farm. The handle is curly maple from our woodpile soaked in linseed oil. BL=5 1/4″, TL=9 3/4″. I like the shape of this handle, but I feel it is in serous need of a guard. This was my second knife and a little more serious an endeavor. It is made from some kind of scrap mild steel I found in a scrap bin (though I did end up being able to harden it a little when I quenched it, and I thought mild steel couldn’t be hardened very much…). 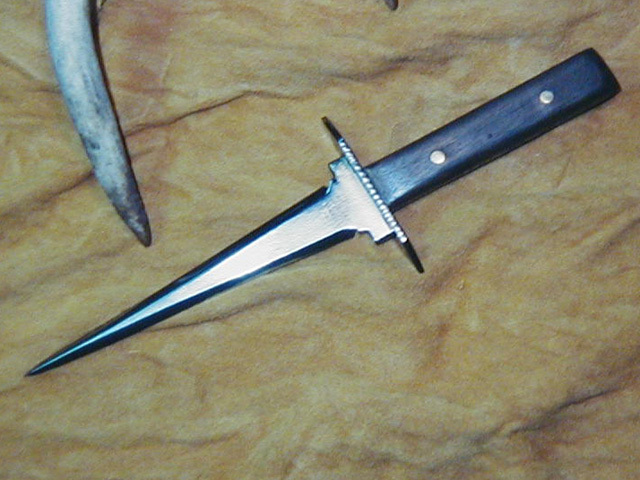 A full tang knife, it was cut out with a hand hacksaw, the bevels were ground with files and on an old two foot diameter sandstone wheel. The handles are mahogany (wood scraps) pined with brass (brazing rod). The double guard started out as and integral, then I added a steel guard I cut out of an old barn door hinge. I made this when I was about 15 yrs old. It is a classic. BL=5 1/2″, TL=9 1/2″. 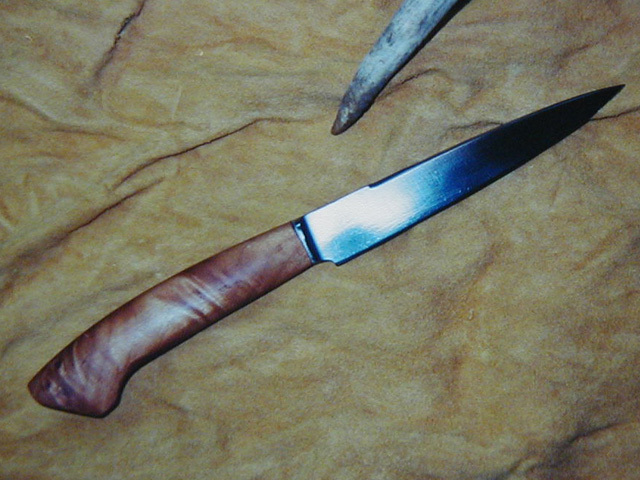 This was probably the first knife I made, and it is pretty primitive. 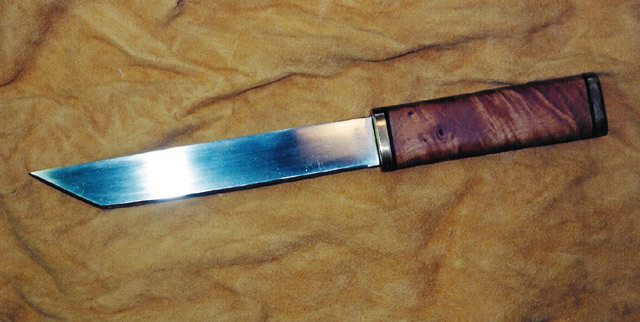 It is constructed of an old carving knife I dug up in a dump and reground (you probably can’t see it but it still says “Utica-Club Stainless Steel” stamped on the blade). 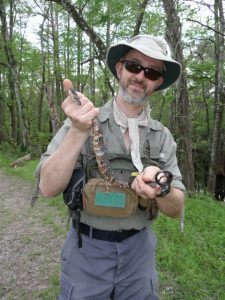 The handle is Red Alder, a common riparian deciduous tree that grows along almost every creek where I grew up. The blade is attached to the handle with two steel pins made from 16d nails and Elmer’s wood glue. BL= 4″, TL=9.25″ I probably made this when I was about 13 yrs old. I guess I didn’t use it for much, the handle looks pretty clean.